As Ireland said farewell to the Obamas, a Co Limerick town was yesterday making final preparations to welcome the Kennedy clan. JFK’s daughter, Caroline Kennedy, along with her husband Edwin Schlossberg, their three children, and other members of the extended family will visit Bruff on Friday. The old courthouse in the town will be renamed after John F Kennedy’s great grandfather, Thomas Fitzgerald, who emigrated to the US from Bruff in 1852. He took with him the family Bible, which was used for the swearing into office of JFK in 1961. The visitors will see the site of the old Fitzgerald homestead on the Palatine Road. The visit has been organised by Bruff Heritage Group. Spokesman Paul Dennehy said: "During Friday’s visit, we will dedicate and rename the former district court building the ‘Thomas Fitzgerald Centre’ to acknowledge the strong links between Bruff and the Fitzgerald Kennedy family. With this visit, every generation of the Fitzgerald Kennedys will have come to Bruff." The centre will be used partly as a training site by Ballyhoura Development and will also be used as both an exhibition and heritage amenity. Mr Dennehy said: "Caroline Kennedy is of course a lawyer and will be very interested to know that an important reform in the history of the Irish legal system was introduced as a direct result of an occurrence in the old Bruff courthouse in 1829 — the right of the Irish citizen to have legal representation was established and the practices of local magistrates in disallowing this was forbidden. "So it is especially significant that she will be present in Bruff to dedicate this historical building to her ancestor." 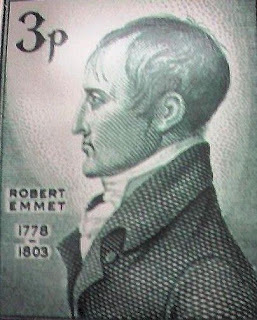 After arriving in Amer-ica, Thomas Fitzgerald married Rosanna Cox from Cavan and one of their children, John "Honey Fitz" Fitzgerald, went on to become mayor of Boston, serving a number of terms in office. Honey Fitz married his second cousin, Mary Hannon, whose family also came from Bruff. Their daughter was Rose Fitzgerald, born Jul 22, 1890. Rose married Joe Kennedy in 1914 and one of their children was John F Kennedy — the 35th president of the US. In 1908, John "Honey Fitz" Fitzgerald and Rose, then aged 18, visited Bruff and stayed in Shaughnessy’s Hotel on Main St for three days. During their stay, they visited the small farmhouse at The Pike, Bruff, where the Fitzgerald clan originated. All that remains now is a model of the farmhouse, which was constructed in the early 1960s by a local artist who married into descendants of the Fitzgerald family. John Fitzgerald Kennedy, America's first Irish-Catholic president, was a son of two families whose roots stretched back to Ireland. The Fitzgerald family was from the rural County Limerick village of Bruff in western Ireland. Between 1846 and 1855, some of the Fitzgeralds migrated to America to escape the devastating potato famine. Thomas Fitzgerald, born in Bruff in 1823, and Rose Anna Cox, born in County Cavan in 1835, were the parents of John Francis Fitzgerald, who was born in Boston, Massachusetts, on February 11, 1863. On September 18, 1889, John Francis "Honey Fitz" Fitzgerald married Mary Josephine Hannon of Acton, Massachusetts. She was the daughter of Michael Hannon and Mary Ann Fitzgerald, both born in Ireland. Their daughter, Rose Elizabeth Fitzgerald, was born on July 22, 1890 in Boston. She was John F. Kennedy's mother. During the same period that the Fitzgeralds migrated to America, Patrick Kennedy, a cooper, left his ancestral home in Dunganstown, County Wexford, and sailed for the United States. In 1849, he married Bridget Murphy, who was born about 1827 in Owenduff, County Wexford. Nine years later she was a widow with four small children, the youngest of whom, Patrick Joseph Kennedy, would become John F. Kennedy's grandfather. In November 1887, Patrick Joseph "P. J." Kennedy married Mary Augusta Hickey, daughter of James Hickey of Cork, Ireland, and Margaret M. Field, also of Ireland. Their son, Joseph Patrick Kennedy, was born on September 6, 1888 in East Boston. He was John F. Kennedy's father. on Thursday 24th September at 8.30 pm. National Census for 1911. The 1911 Census is now available on-line. See the item below. 1911 Census for Co. Limerick is now online! The 1911 census is now on line from the National Archives. The records for Bruff can be searched as can the records for all adjoining areas. Click here to take you to the homepage relating to Bruff Town in 1911. John Kennedy’s great-grandfather, Patrick Kennedy, left Dunganstown, County Wexford during the Great Hunger and became a cooper in Boston. The Kennedy home in Dunganstown was turned into a museum in 1999. Another branch of JFK’s family, the Fitzgeralds, came from County Limerick village of Bruff and carried with them a family bible. Over a century later John Kennedy would lay his hand on that same bible as he took the oath of office of the nation that took in his poor immigrant ancestors. One can only imagine the reaction of the Fitzgerald’s on the way to “the land of the free” had someone predicted the future purpose to which that bible would be applied. RevGordon Massey (1803-1852) was Church of Ireland Vicar in Bruff. Click here to read his account of Bruff during the Famine time. THE FAIRY RATH OF BRUFF. BY BRIAN O'FLAHERTY. THIS song and air take their name from a celebrated fairy fort situated at the town of Bruff, in the county of Limerick, and like many others in this collection, would have probably been lost, or left in the " world of spirits," had it not fallen into our hands. Brian O'Flaherty, the author, was an humble peasant, a mason by trade, and, for aught we know, he may have been "master-builder" to his friends—the fairies and "good people" of Bruff. He was a native of Bruff, or its vicinity, but we cannot discover when he lived. It appears he was not numbered among the literary portion of the bards of his day, but was considered rather presumptive in assuming the name, and for such conduct he was cited, prosecuted, and expelled, at one of the Bardic Sessions then held in Munster. However, Brian was not so easily got rid of, and in order to gain favour, he mustered up all the natural talent he was possessed of, and composed the present song. Bruff is situated on the banks of the river Camog (Anglicised " The Morning Star"), and lies about fifteen miles from Limerick. Tradition informs us that the banks of this river up to the town were formerly laid out with beautiful gardens, where all species of plants and trees peculiar to this country grew, and was much admired for being the resort of birds of all kinds, from the melody of whose notes it gained the appellation of Binn (melodious). At the west side of the town there is a little eminence called Lios (Fort), and there is also a castle, or Brogha, which is supposed to have been built by the De Lacy family shortly after the English invasion. Where rises Bruff's old Fairy Rath. And would almost awaken the Dead ! Sarsfield Wall Mural ... now gone! and the new one is nearly finished! Lough Gur & District Historical Society was founded in 1984 and has a regular membership of 80 plus. It aims for ten events annually between lectures and field trips. Its major achievement is the publishing of thirteen historical journals. Number thirteen was launched in 2004 to celebrate 20 active years. Number 14 was launched this month. KILMALLOCK JOURNAL The 2006 Kilmallock Journal is now on sale in the town. The Journal contains a mix of articles dating from the 1800's up to the present day. Tributes is paid to the life and work of Mainchin Seoighe, a long time contributor to the Limerick Leader and author of over a dozen books who died this year. 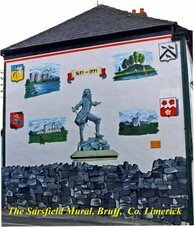 His great work of local interest is the Story of Kilmallock which is an invaluable source of information about the history of Kilmallock. The journal which costs €10 is on sale at the museum which is open between 11am and 3pm Monday to Friday and in the following shops O'Keeffe's, Londis on Sheare's Street, Maureen Feores on Sarsfield Street and Abbey Printers and Centra on Lord Edward Street.